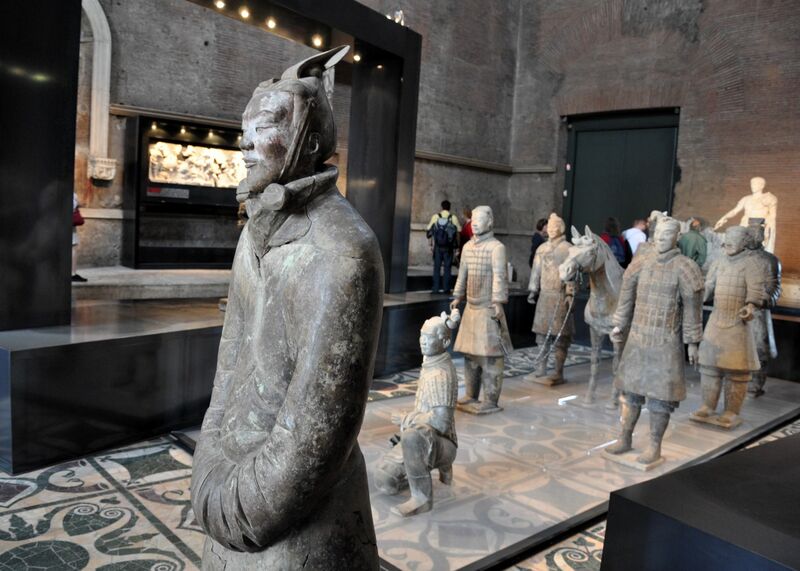 It's not every day that you see China's ancient, famous terracotta warriors from Xi'an in the also-ancient, also-famous Roman forum. 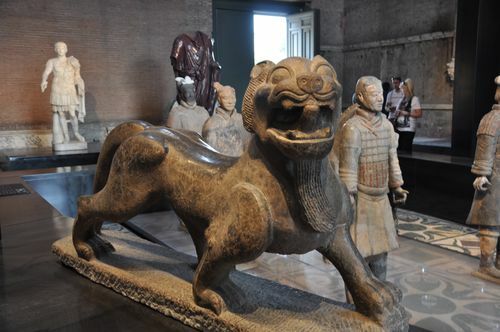 From now until January 9, 2011, Rome is hosting the exhibit "The Two Empires: the Eagle and the Dragon." Held in the Curia, or the ancient senate house in Rome's forum, the exhibit is the first to explicitly compare China's empire with Rome's. But it's just a taste of what else Italy (and China) have planned. The parallels between the countries' histories are certainly there. Both were extraordinarily sophisticated, militaristic empires. Both unified dozens of warring territories under the same political and economic systems. And both influenced all of history; just as modern-day Europe and the United States owe a great debt to the ancient Romans, so, too, do the modern-day Chinese owe the Qin and Han dynasties. (Those dynasties ruled China from the 3rd century B.C. to the 4th century A.D., a timeline that, too, parallels the height of the Roman empire). And the artifacts that Rome's gotten ahold of for the exhibit are pretty fantastic. Most striking are, of course, the terracotta warriors, here on one of their rare trips away from Xi'an, China. More than 8,000 of them, each one different and detailed, were sculpted around 210 B.C. for Emperor Qinshihuang's tomb. Eight (plus a horse) are now in the Curia (pictured above). Seeing them in the same space as first-century Roman marble statues is striking — no less because of how much the two cultures shared in terms of their sophistication and technical skill alone. While neat, the exhibit is far from thorough. It's just a teaser. And that's the whole idea. It's a preview of a bigger exhibit coming to Palazzo Venezia in November, which will boast 450 different Italian and Chinese pieces. It also launches a long-term collaboration and cultural exchange with China, kicked off by Chinese Prime Minister Wen Jiabao's visit to Rome on October 7. That collaboration includes the participation of Italy's ministry of culture in China's new National Museum in Beijing, with a wing focused on Italian culture — and a reciprocal space for a state museum of Chinese culture in Palazzo Venezia. So stay tuned. Update, Nov. 17: See my new blog post on the "Eagle and the Dragon" exhibit for information on the Palazzo Venezia show. The exhibit at the Curia is open from 8:30am-6:30pm until October 24, from 8:30am-4:30pm afterward. Entrance is included in your forum/Colosseum/Palatine ticket. For more information (in Italian), click here.